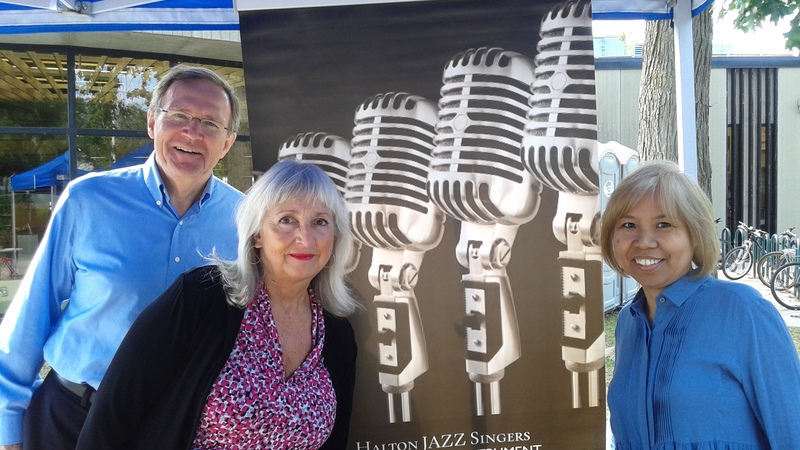 Halton JAZZ Singers were invited by the Town of Oakville’s Culture & Recreation Department to add some vocal jazz the the outdoor Saturday farmer’s market on Lakeshore Road in downtown Oakville. The sun co-operated and from 9:00 a.m. – 1:00 pm people were strolling, buying fresh produce, and/or checked out the various recreation & culture related event events were able to enjoy the FREE entertainment provided by Halton JAZZ Singers! 3 SETS and a quick game of checkers on the big board at break gave everyone ‘smiling faces’ for the rest of the afternoon. Thank you for the invitation… we would love to do it again…maybe at a Christmas markets, perhaps?